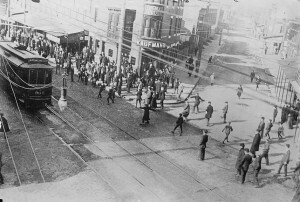 During the strike, the widespread dissatisfaction with the Rapid Transit Company over labor conditions took violent turns, as in this February 20, 1910, photo in which strikers throw stones at a passing trolley. The escalation from simple protest to violence and sabotage--to render streetcars inoperable--led the Philadelphia police to arrest high-ranking union organizers and sympathy strikers. The police were authorized to “storm” strikers with guns and batons. Once the general strike commenced in March, the police were used as a virtual private security force for the RTC. The citizenry’s resentment toward Philadelphia’s Republican-dominated government had been growing since the early 1900s, and as the number of strikers grew the chance for violence increased. To the public, the use of the police showed that Philadelphia’s political leaders were more concerned with protecting corporate interests than those of its citizens. Violent clashes between strikers and police during the general strike led to the deaths of as many as ten strikers and bystanders, according to newspaper reports. A group of strikers and sympathizers come together in public to demonstrate the solidarity of organized workers across industries in opposition to the public-private alliance between the police, the administration of Mayor John Reyburn, and the Rapid Transit Company. The issue of political corruption in the public transportation system that implicated both private interests and the city’s Republican political machine helped to increase the number of strikers and supporters to an estimated 140,000 people. 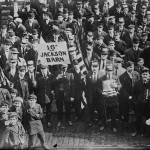 The solidarity displayed by other unionized workers, not just Local 477 of the Amalgamated Association of Street and Electric Railway Employees of America, showed the public dissatisfaction with the exploitation of workers. Certain transit company policies that were unfriendly to customers, such as discontinuing transfers, contributed to public support for the strike. Protesters parade through the streets of Philadelphia while police on horseback patrol during the general strike of 1910. In anticipation of the strike, the Rapid Transit Company used the Philadelphia police as on-call private security and emergency police stations were constructed at key RTC depots. At the height of the strike, RTC fed and housed over 7,000 strikebreakers and police officers. The use of the Philadelphia police was evidence of the power the company held within the city government and contributed to the public perception that corporate interests were the focus of the city government. Furthermore, the people who labored felt often overlooked and faced dismal working conditions and limited job security. Unionizing and going on strike was the only way for many to have their voices heard, and the risks associated with striking—possibly losing their jobs, being arrested, facing violence—was worth it to many to gain some control in their work life. The issue of government corruption in Philadelphia gained widespread notice in 1903 when journalist Lincoln Steffens published a series of articles exposing municipal corruption in the United States. The fifth article in this series focused on Philadelphia, and Steffens believed Philadelphia was worse than any other place he had investigated. Steffens declared: “Philadelphia is simply the most corrupt and the most contented.” The idea that commercial interests prevailed over the interests of the people allowed labor leaders to characterize the conflict as pitting Mayor John E. Reyburn and the Rapid Transit Company--lawless and violent-- against the justice-seeking workers and residents of Philadelphia. On March 5, 1910, between 60,000 and 75,000 workers complied with the Central Federated Union’s call for a general strike in solidarity with the striking streetcar workers employed by Philadelphia’s Rapid Transit Company (RTC). Business and political elites feared that the strike would spread to other parts of Pennsylvania and to cities where workers had pledged their support, including Newark, San Francisco, and New York. The general strike, which lasted until March 27, grew to an estimated 140,000 people. 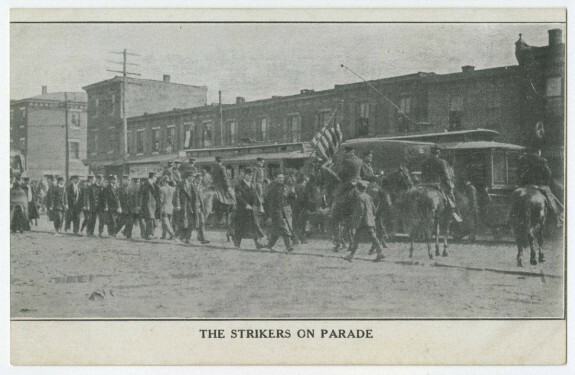 The strike saw loss of life and property in violent standoffs between strikers, strikebreakers, and police officers, and spoke to widespread dissatisfaction with labor conditions and municipal corruption in Philadelphia. 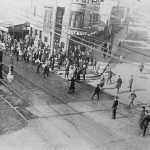 The general strike was precipitated by an escalating dispute with RTC. The company had laid off 173 organized workers (who had unionized under Local 477 of the Amalgamated Association of Street and Electric Railway Employees of America) in anticipation of the February municipal elections—thus delaying a strike and helping Republicans sweep the municipal elections. RTC admitted to discriminating against Amalgamated members in favor of “loyal” workers, and, in response, 6,000 workers called a strike for January 18. The walkout was the latest in a succession of strikes in Philadelphia’s transit industry, including strikes in 1895 and 1909. The public transportation system had been mired in corruption that implicated both private interests and the city’s Republican political machine (the director of public safety was a large stockholder in RTC). Incorporated in 1902 as a long-term leaseholder of nearly all of Philadelphia’s railway lines, the company had renegotiated its contract with the city in 1907. RTC agreed to pay a fixed fee in return for relief from its obligation to repair roads and clear snow, while also securing a monopoly on all future railway projects through 1957. As a result, service worsened and the city took on a tremendous fiscal burden. By the time of the 1910 strike, press reports had documented widespread public dissatisfaction with RTC, which had discontinued transfers and discounted strip tickets and initiated fare hikes, among other service issues. 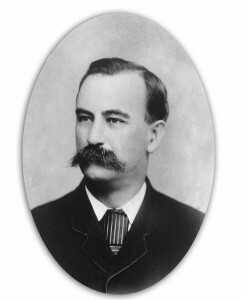 Strike organizers saw the company’s disrepute as key to the strike’s chances for success: Leaders tied RTC and the administration of Mayor John E. Reyburn (1845-1914) to lawlessness, violence, and anarchy, in opposition to justice-seeking workers and residents of Philadelphia.Organizers saw the strike as a local stage for broader conflicts between organized labor and capitalist interests. In order to appeal to nonunionized workers and the general public, leaders discouraged radical “outsiders” from infiltrating the strike and any violence other than destruction of RTC property. The general strike was a tactical escalation in response to RTC’s unwillingness to arbitrate. The key disagreement between RTC and Local 477 was the exclusive right of the union to organize RTC workers, which would enable membership growth and bargaining power, as had been achieved by transit workers in San Francisco, Detroit, Cleveland, and Pittsburgh. RTC knew this, and was committed to maintaining an open shop to prevent a wage increase. RTC would not surrender on what it considered “fundamental and inalienable rights” as a corporation, namely: to not be subjected to any outside organization and to be able to fire employees at will. Anticipating a strike, in January RTC hired and trained nearly 1,000 on-call workers to be used as strikebreakers. 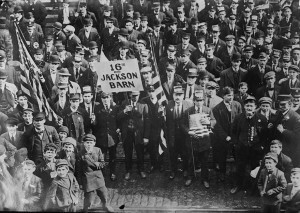 During the strike, RTC officers brought in additional workers from Boston, New York, Baltimore, Washington, Norfolk, Richmond, Reading, Wilmington, Cleveland, St. Louis, and smaller towns. RTC built dormitories at its nineteen depots to house these new workers, with a commissary who directed hundreds of cooks and other staff. Further, the Philadelphia police acted as on-call private security for RTC, and emergency police stations were constructed at key RTC depots. At the height of the strike, RTC fed and housed over 7,000 strikebreakers and police officers. 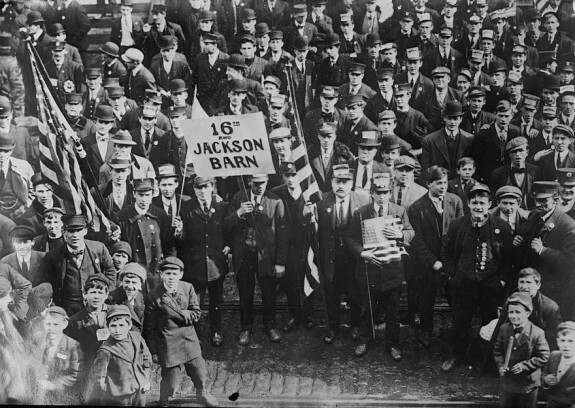 During the strike, Philadelphia police arrested high-ranking union organizers and sympathy strikers—fifty percent ofwhom were under the age of 18— being authorized to “storm” strikers with guns and batons. 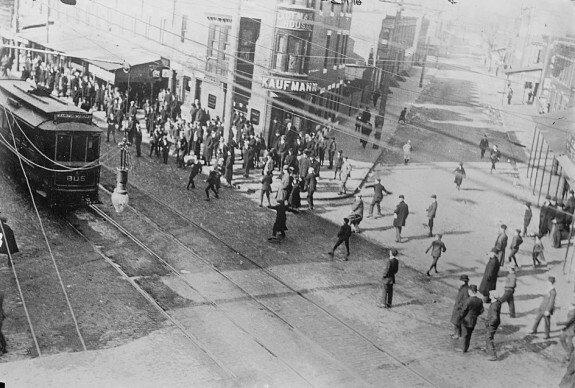 Newspapers reported violence and sabotage to render streetcars inoperable, as well as retaliation by strikebreakers who shot into crowds and accelerated along their routes, causing several bystander fatalities. Newspapers reported that at least two young children lost life and limb from the streetcars, and that as many as ten strikers and bystanders were killed by gunfire from strikebreakers and police. 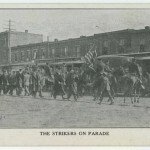 Though the general strike ended on March 27, the streetcar workers remained on strike until April 19. After three months, RTC finally agreed to a wage increase, the rehiring of strikers within three months (though stripped of seniority), and mediation of the initial 173 union-targeted firings. Overall, the nine-week strike cost RTC $2,395,000 and the city millions more, and 3,400 workers returned to work having won some of their demands. The strike had organized workers across industries in opposition to the public-private alliance between the police, the Reyburn administration, and RTC. It convinced RTC and the city that “rioting cannot be effectively suppressed except by radical measures”—namely, police officers’ liberal use of revolvers and clubs—and compelled the city and elite reformers to push for a strengthened police force and structured intervention to prevent juvenile delinquency. Though the strike did not achieve its central demand—exclusive union recognition— it paralyzed the city, garnered tremendous solidarity, and demonstrated the capacity of labor to organize across industrial lines. Conway, Thomas Jr. “Street Railways in Philadelphia Since 1900.” Annals of the American Academy of Political and Social Science, Vol 24 (September 1904): 70-76. Foner, Philip S. The AFL in the Progressive Era, 1910-1915. New York: International Publishers,1980. 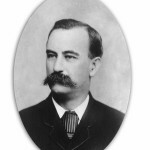 Lewis, Edwin O. “Philadelphia’s Relation to Rapid Transit Company.” Annals of the American Academy of Political and Social Science (May 1908): 66-77. Kimball, J. L., and Ken Fones-Wolf. “Notes and Documents: Mass Strikes, Corporate Strategies: the Baldwin Locomotive Works and the Philadelphia General Strike of 1910.” Pennsylvania Magazine of History and Biography, Vol. 110, No. 3 (June 1986): 447-57. Harold E. Cox Transportation Collection and Philadelphia Rapid Transit Company photoprints 1903-1910, Historical Society of Pennsylvania, 1300 Locust Street, Philadelphia. Strike activity was concentrated at transit hubs in West Philadelphia, Germantown, Kensington, and Frankford. Temporary housing services were provided at depots including the Sixty-Ninth Street Terminal.